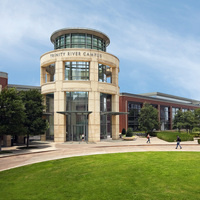 Trinity River Campus Building is the main building for the campus. It houses classrooms, registrar, business services, advising and counseling, testing centers, financial aid, career and employment services, riverfront café and coffee shop, the bookstore, fitness center, police department and administrative offices. Cool clubs, and interesting people. Great food and wonderful entertainment. I had a good time mingling with other students.